Again our Deal of the Week gets contributed by Mighty Deals. On Mighty Deals Verb has been featured in the past, yet not in its entirety. Thus, the new deal is a novelty. Today, and for a few more days to come, you are able to purchase the complete Verb family with all its 72 fonts for 37 dollars total. That equals 50 cents per font, where the regular price of 167 dollars for the whole family is almost five times as high. Verb is created and maintained by Yellow Design Studio, who regularly bring joy to the world of design with their amazingly awesome fonts. You probably remember the great Veneer which we featured here or Melany Lane Script which we featured there. Based on the sans-serif typeface, the Verb font family is a friendly and heart-warming font full of energy! 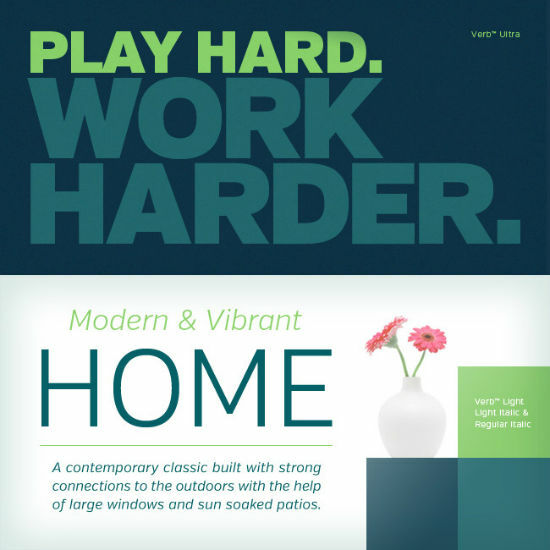 Get your latest projects moving! 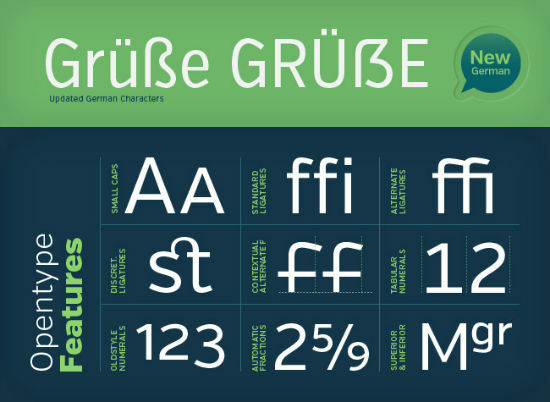 Your purchase of this awesome font gets you loads of useful features like small caps, discretionary ligatures, alternate connected ligatures, old style numerals and currency, tabular numerals, automatic fractions, superiors and inferiors, ordinals, contextual alternate “f”, and extensive language and currency support. 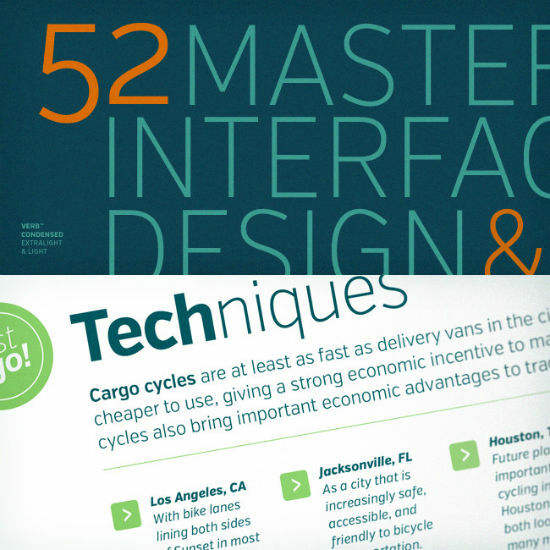 You’ll even get a full “f” ligature set to help improve text flow when used in real long settings. 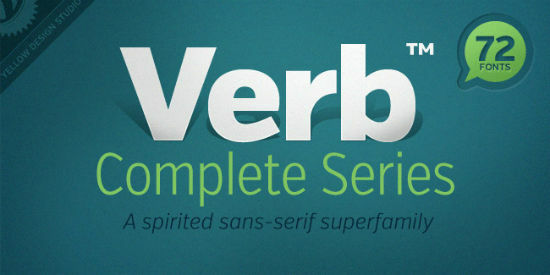 Verb includes four subfamilies: Regular, Condensed, Extra Condensed, and Compressed. Even more, each subfamily sports 9 different weights! With each subfamily, you’ll get the following weights: Extralight, Light, Regular, Medium, Semibold, Bold, Extrabold, Black, and Ultra. With 4 subfamilies and 9 weights each, that’s like getting 36 different fonts in one! Oh, right. 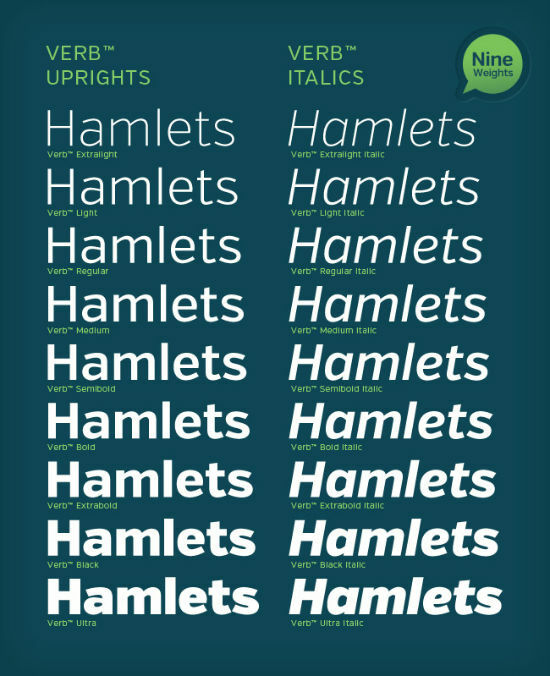 And there’s a regular and italics version for each, which doubles up to 72 different fonts! The larger the size, the more lively shapes come into focus. Both Desktop and Webfont versions support the following languages: Afrikaans, Albanian, Basque, Bemba, Bosnian, Catalan, Cornish, Croatian, Czech, Danish, Dutch, English, Estonian, Faroese, Filipino, Finnish, French, Galician, Ganda, German, Hungarian, Icelandic, Indonesian, Irish, Italian, Kalaallisut, Kamba, Kikuyu, Kinyarwanda, Latvian, Lithuanian, Luo, Malagasy, Malay, Maltese, Manx, Morisyen, North Ndebele, Norwegian Bokmål, Norwegian Nynorsk, Nyankole, Oromo, Polish, Portuguese, Romanian, Romansh, Sango, Shona, Slovak, Slovenian, Somali, Spanish, Swahili, Swedish, Swiss German, Turkish, and Zulu. 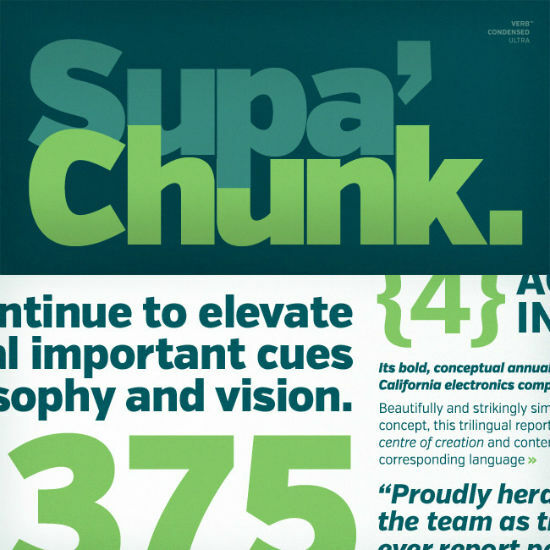 The Verb Font Family is available in both Desktop and Web font formats. Desktop font files come in .OTF format and are compatible with both Windows and Mac computers. 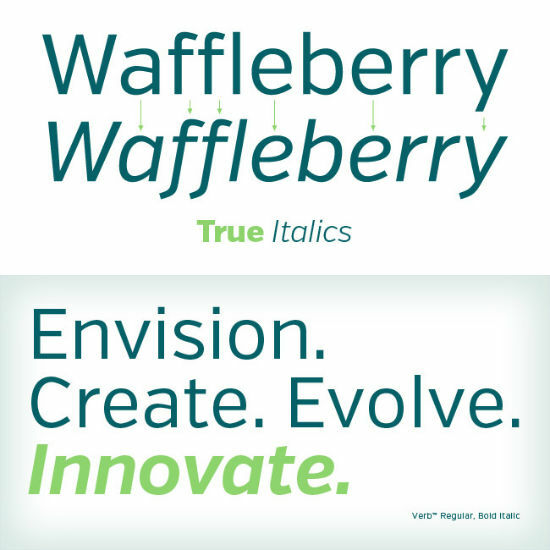 Web fonts are delivered in .EOT, .SVG, .TTF and .WOFF formats. Verb comes at you with 3 fantastic deals to choose from! This is the same deal Mighty Deals had offered previously for the regular set. 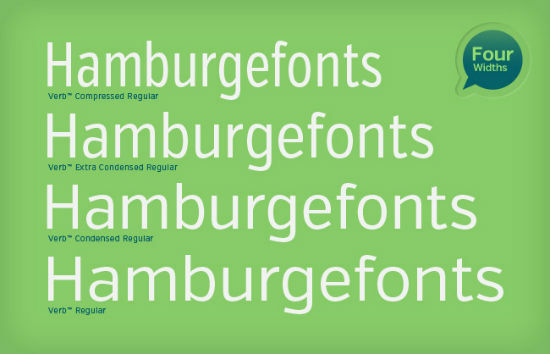 Get every font in the Verb Font Family, which sums up to 72! Already took advantage of our previous Verb Mighty Deal? 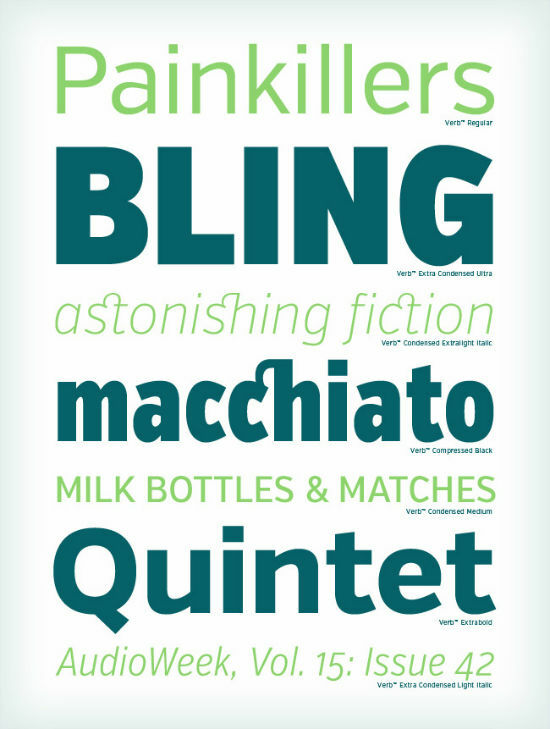 Grab just the new fonts (Condensed, Extra condensed and Compressed) and complete the whole family! Now, that all is said and done: Head on over to Mighty Deals and click their BUY button.